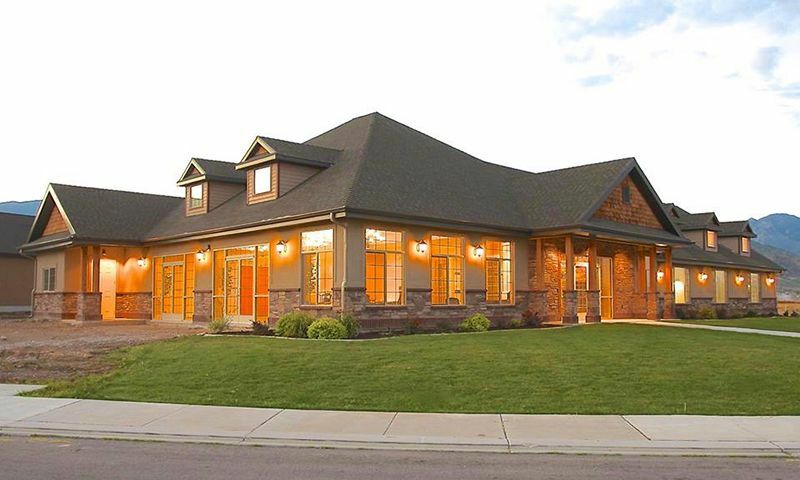 Heritage Village is a 55+ community located at the base of the Nebo mountains in Payson, Utah. This scenic active adult neighborhood will consist of just 93 quality-crafted single-family homes by Heritage Builders. Residents of Heritage Village will also enjoy well-appointed amenities in the 7,500 square-foot clubhouse. Heritage Village provides the social environment where neighbors become fast friends in a welcoming and quiet setting. Ideally situated in the Salt Lake City, Utah area, residents are never far from daily conveniences and attractions. Homeowners also enjoy majestic mountain views and a small town vibe in Heritage Village. The central hub of social recreation and physical activity is held at Heritage Village's clubhouse. The spacious 7,500 square-foot clubhouse provides plenty of areas where homeowners can get together for social events or special occasions. They can mingle in the great room to watch T.V., play billiards, cards, Ping Pong, or games with friends. The library is the perfect place to spend some quiet time with a good book. A dining room and catering kitchen come in handy when preparing a snack for a party. Residents can stay in shape by using the cardiovascular and weight-training machines in the exercise room. After an invigorating workout, they can relax in the indoor pool or spa. Residents can stay active outdoors as well. Neighbors often challenge each other in a fun game of horseshoes or pickleball. An outdoor patio is a great place to enjoy a picnic or a BBQ with friends. Homeowners enjoy scenic strolls throughout the community's walking and biking trails as well as the picturesque natural park space. Heritage Builders began construction of Heritage Village in 2011 and plans to have 93 single-family homes upon completion. Homebuyers can choose from seven distinct single-family floor plans that range in size from 2,822 to 4,089 square feet. These residences have one to four bedrooms, two to three-and-a-half bathrooms, and an attached two-car garage. Many homes can be customized to suit buyers' styles and some offer finished or unfinished basements for additional space. Some features include open and bright layouts, energy-efficient designs, family and dining rooms, gourmet kitchens, granite countertops, large living rooms, elegant master suites, plenty of storage space, and front porches with manicured lawns. Heritage Village provides a relaxed and low-maintenance lifestyle for 55+ residents. They can be as active and social as they wish by participating in a Zumba class, attending a movie night, or exchanging books with neighbors. They can spend their days pursuing hobbies with other like-minded adults or start a new club based on similar interests. With only 93 homes in Heritage Village, it's easy for neighbors to become fast friends. Residents can leave the hassles of exterior home maintenance behind as well. A homeowners' association fee takes care of lawn mowing and snow removal so active adults can truly enjoy a calm and stress-free lifestyle. Located in Payson, UT, Heritage Village is surrounded by natural beauty like dramatic mountain views, park space, and the Payson Temple. Not only do residents living in Heritage Village enjoy great views, but they also have easy access to Interstate 15 and plenty of shopping and dining options. Just a few minutes outside of the community's entrance is a Walmart, Pizza Hut, gas station, banks, and other fast food chains and retail shops. Homeowners can explore Utah Lake for water, boating, and fishing activities. Active adults can drive about an hour to Salt Lake City for additional culture and attractions. Salt Lake City International Airport is also accessible for long distance travel. Heritage Village is a beautiful 55+ community that provides small town charm, plenty of amenities, and local recreation nearby in Utah County. Clubhouse - 7,500 Sq. Ft.
Homebuyers can choose from seven distinct single-family floor plans that range in size from 2,822 to 4,089 square feet. These residences have one to four bedrooms, two to three-and-a-half bathrooms, and an attached two-car garage. Many homes can be customized to suit personal styles and some offer basements for additional space.